In 1798. the Reverend Thomas Malthus wrote his influential essay on population, arguing that population grows exponentially while the supply of food, energy, and other commodities only grows linearly. As a result, the vast majority of humankind is doomed to be mired in poverty unless some even grimmer reapers than starvation (war, disease, etc.) are brought to bear, or births are moderated. 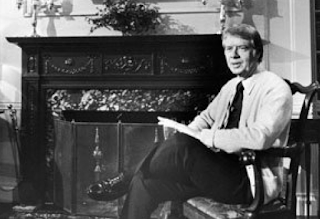 In 1978 U.S. president Jimmy Carter, reflecting a popular intellectual Malthusian sentiment of the time, sat by his fireplace in a comfy sweater and instructed Americans to turn down the thermostat lest we run out of oil. (Here's a similar speech he gave a year earlier). Malthus' description of a general pattern of human history (and indeed of the history of all living things, an observation that inspired Charles Darwin) was by and large accurate. But since the time of Malthus, writing during the early industrial revolution, developed and even most developing economies have managed to trot or even race ahead of Malthus: per capita income has increased tremendously far beyond the near-starvation limits set by Malthusian theory. Industrial productivity has pulled vastly increased amounts of commodities from the earth, using them to produce an unprecedented abundance of goods. Meanwhile population growth has radically declined until today many developing economies have below-replacement birthrates. 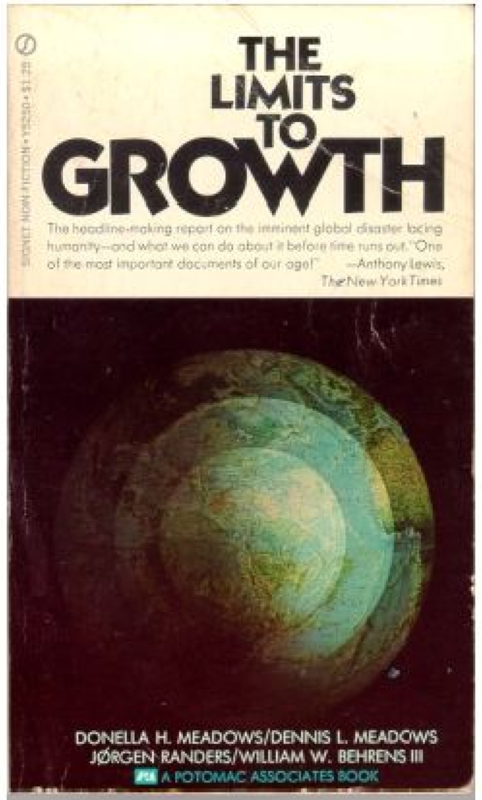 Nevertheless, Malthus' observations and reasoning periodically stage an intellectual and popular comeback: industrial civilization can only cheat Malthus so long, thought leaders warn us; if we do not mend our unsustainable ways, and convert from gluttony to stringent conservation, Malthus' grim formula will soon return to wreak an awful revenge. What chemical inputs does life depend on most? Hydrogen and oxygen from water is plentiful. Plants obtain copious carbon by breathing in carbon dioxide (and animals from eating the carbohydrates, fats, and proteins in the plants or other animals). Nitrogen-fixing bacteria (and legume plants that are symbiotic with them) obtain plenty of single-N nitrogen by splitting the plentiful but strongly bonded N2 in our atmosphere. 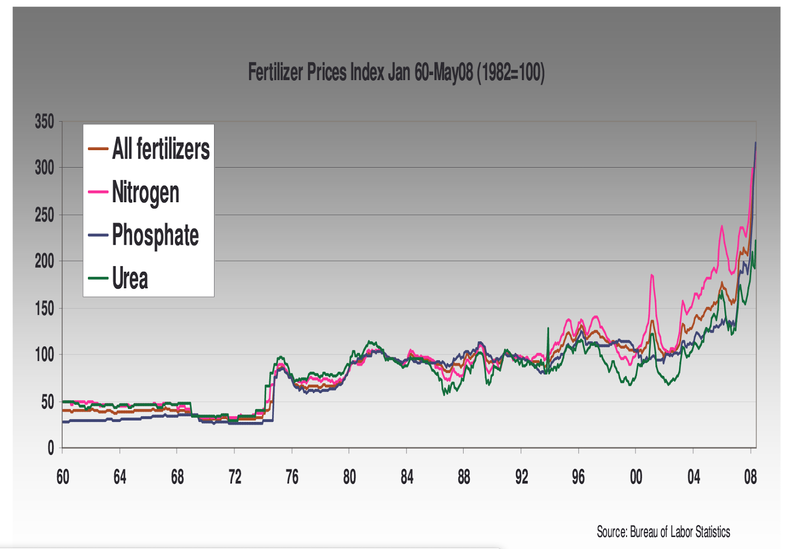 Artificial means of nitrogen fixing depend primarily on natural gas or oil prices. Metals are plentiful in soil. 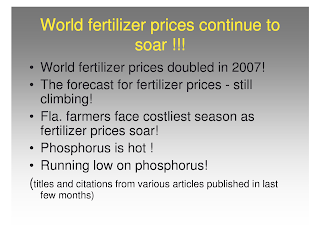 The only significant remaining scarce ingredients for crops are potassium (K) and phosphorous (P) -- and of these on land phosphorous, which must be available in the form of phosphate, is the most needed and most lacking of all. No technology can substitute anything else for phosphate: it has to be phosphate in order to form DNA, the essential cell energy molecule ATP, and crucial parts of our bones and teeth. 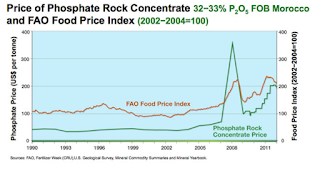 Phosphate is thus the most geopolitically important agricultural input and exhibit A in Malthusian warnings about limited resources and unsustainable practices. 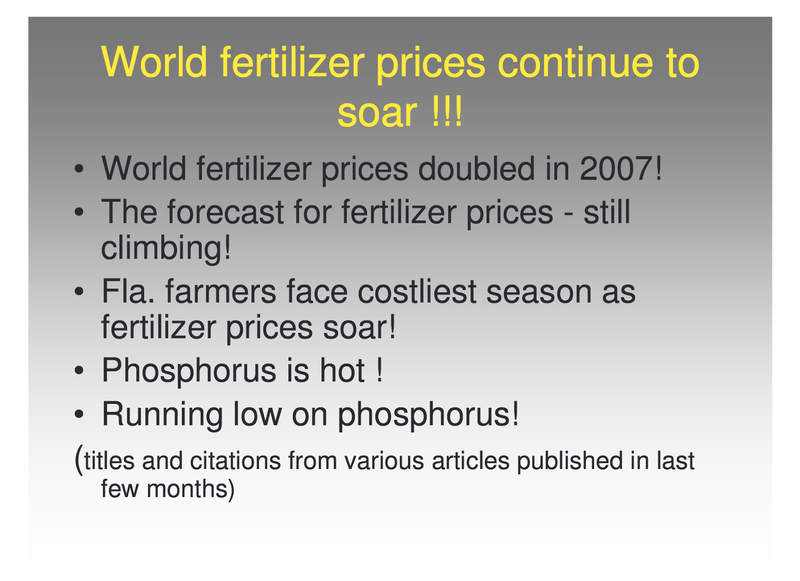 This also makes phosphorous a favorite target of stockpilers and speculators during a Malthusian scare. The most important commodity for mining, manufacturing, and especially transportation, for almost all the 20th century and through the present time, is petroleum oil. Internal combustion and other engines powered by fuels refined from petroleum have since the early decades of the 20th century increasingly dominated he transport of goods and people on air, sea, and land. For much of the late 19th and 20th centuries heating was a major use of oil; in that use it is being eclipsed by its cousin carbon fuel, natural gas. Oil is also the world's most important feedstock for the production of plastics, synthetic fibers, and a wide variety of other chemicals. While oil makes up a much larger price value of trade than phosphates, oil in the long run is potentially far more vulnerable to substitution innovation. And as we shall see, it also has been at least somewhat more amenable to technological improvements in supply. Between the mid-1800s, by which time the industrial revolution had transformed much of Europe, and the end of the Bretton Woods era, sentiments about the unsustainability of industrial civilization were usually on the intellectual fringe. But since the late 1960s, cries of doom and sophisticated warnings that we must redesign our economy, our technology, and civilization itself to "sustainable" lifestyles have become mainstream. Malthusian allegations that we face diminishing, or soon-to-be diminishing, supplies of raw materials such as oil, natural gas, metal ores and fertilizers, have become "common knowledge." This component of green ideology has been fueled by two Malthusian scares: two substantial periods, the first between about 1968-1980, the second c. 2004-14, during which nominal commodity prices (i.e. 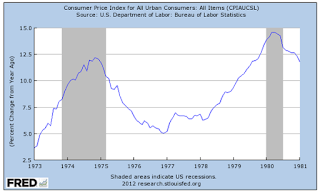 the prices you see posted) increased dramatically, and "real" (adjusted for some measure of inflation, such as the consumer price index) commodity prices increased substantially. These price rises led to prophecies of a coming great diminution in our abilities to feed, cloth, and transport ourselves, much less to enjoy all the other abundant goods we have become accustomed to in the developed world as a result of the industrial revolutions that have occurred during and since the time of Malthus. We faced a miserable future unless we changed our ways. Unless we stopped having babies and stringently conserved and recycle our resources (the general green movement), or invest in solar power and electric cars (the Silicon Valley green movement), our future was deemed to be doom. This remains a predominant ideology in Western culture today. For many of us in the developed world, a future of higher prices for energy and other commodities does not seem like such big a deal as it once did: we already have more physical goods than we know what to do with, and cutting back to achieve more peace of mind now seems to take and be worth more effort than accumulation. While the better-off fractions of the developed world have by and large reached a level of satisfaction in their consumption of the abundance of goods made possible by the industrial revolutions, the poorer fractions and the developing world have not. Nevertheless, during the Malthusian scares commodities did seem to grow much more expensive and scarcer -- and not just a few commodities but commodities in general. 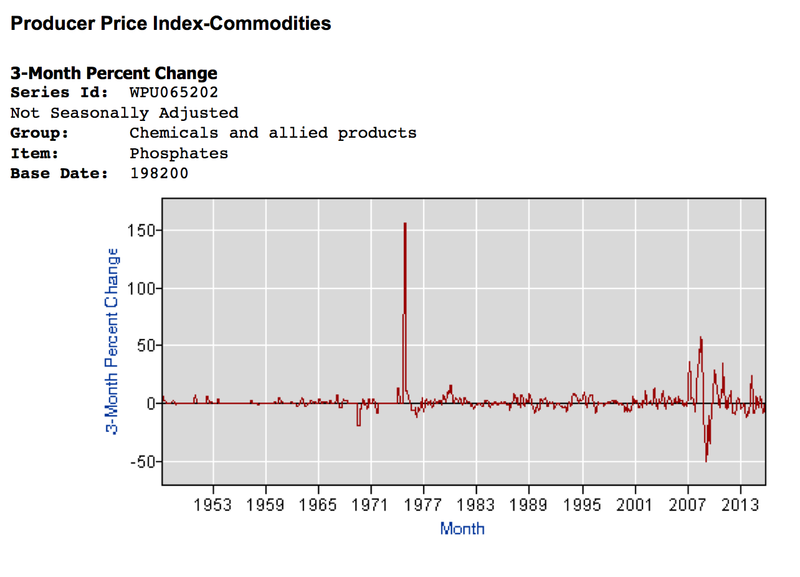 Indeed, the prices of a broad range of industrial commodities went substantially higher, often much faster than the general inflation rate -- a sure sign, according to traditional industrial economics, that industrial supply was being outstripped by consumer demand -- that we were getting approaching, often rapidly, Malthusian limits rather than moving further away from them as has been the general trend since Malthus. 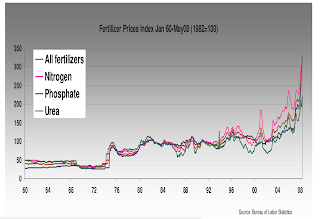 During most of the years of the first and second scares raw material and food prices skyrocketed, practically across the board. 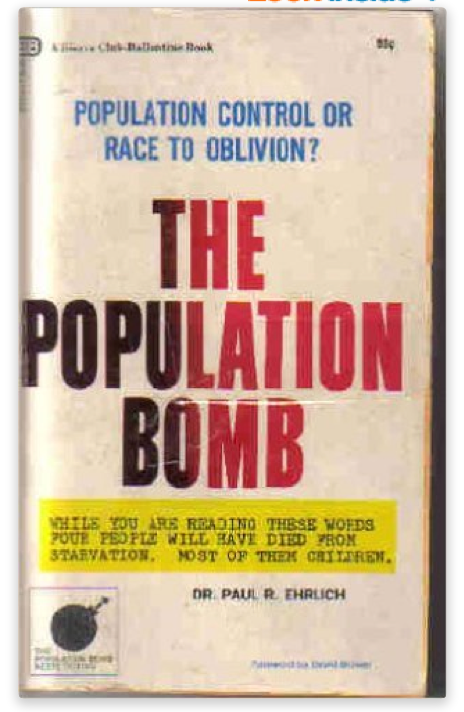 Why was this happening, if not the predictions of Malthusians starting to come true? Let's take a look at the scares, and the economic histories surrounding them, to find out. From ancient civilization to the late 1960s, civilization's money was generally defined by, and either consisted of or was convertible to, standard weights of precious metals. Even thousands of years before the invention of coinage, most fines in the earliest recorded code of laws were defined and paid in weights of silver. 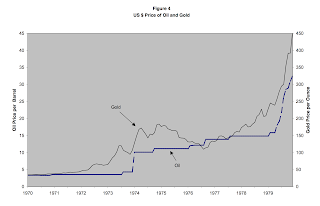 While the role of precious metals in monetary affairs declined throughout the 20th century, with many episodes of fiat currencies untied to precious metals inflating and hyperinflating, under the post-World War II Bretton Woods system United States and its allies up to 1968 had a gold window whereby authorized high rollers (among them most other governments) could still cash in their dollars for gold at a promised official rate. Under Bretton Woods most other free world currencies were pegged to the dollar. So you could cash in your local currency for dollars, and (if you were an authorized high roller) your dollars for gold, all at committed official prices. But Bretton Woods, depending on a single country to ultimately back the entire free world's money, was not financially sustainable. It established the U.S. dollar as the free-world standard after World War II, when the the U.S. made half the world's industrial goods and held over half of its financial reserves. But the economies damaged by World War II quickly recovered, and agricultural and industrial revolutions spread to the developing world where economic growth greatly quickened. While the U.S. economy in its own terms was thriving, the relative U.S. role in the world economy declined as those of the rest of the world quickly rose from the ashes. By the mid-1960s the U.S. held only 16% of the world's financial reserves, and even less than that of its gold reserves. Even though it promised to exchange dollars for gold on demand, the U.S. Federal Reserve issued more notes, and its banks more broadly issued more dollar credit, than could possibly be securely backed by its diminishing gold reserves. Meanwhile, most academic and government economists scoffed at the gold standard as a "barbarous relic" and held that world monetary conditions would be improved if the U.S. stopped pretending that the dollar was pegged to gold. By 1968 the U.S. was no longer willing to honor its commitment to deliver an ounce of gold for $35. The U.S., which since the time of Franklin Roosevelt had banned the domestic private gold trade, now tried with futility to halt overseas private trade by refusing to deal in gold with governments that allowed private gold trade. (In reality, this was less a serious attempt to stifle overseas private gold trade than an attempt to close down the gold window in a face-saving way). The U.S. government forced the London Gold Pool, the gold window mechanism operating between the major free world central banks, to declare a "bank holiday", i.e. shut down its operations. But of course this didn't stop non-Americans from trading in gold; quite the opposite: it signaled that the U.S. dollar, and all the currencies pegged to the U.S. dollar, had radically changed in form, and might no longer be as reliable as a store of value. The free-market price of gold soon rose well above $35 official rate. The U.S. was by 1971 forced to officially float the dollar (it had already been floating de facto for up to three years), officially making the U.S. dollar a purely fiat currency. 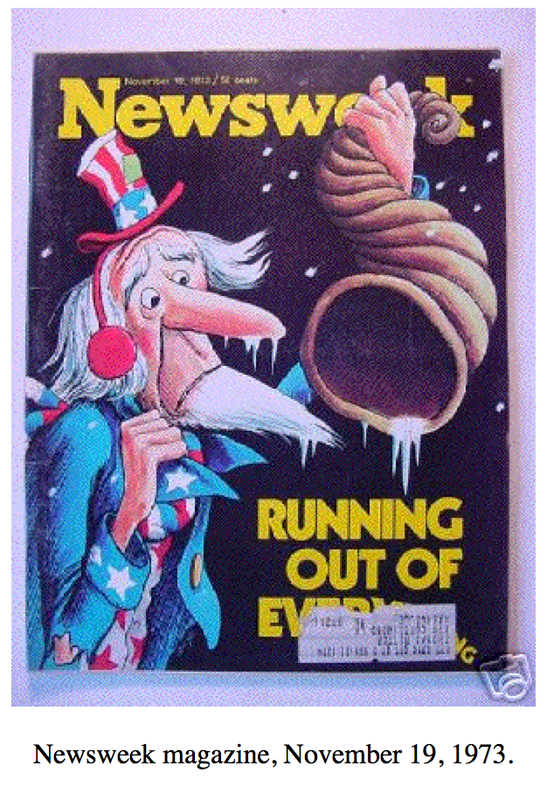 The pegged currencies followed suit, and Bretton Woods was dead. All this monetary obscurity matters for our Malthusian scares not just because all the aforesaid commodity prices from then until now are quoted in major fiat currencies, most usually in dollars, and these signals prices send about industrial supply and demand can only be as reliable as the currencies those prices are denominated in. 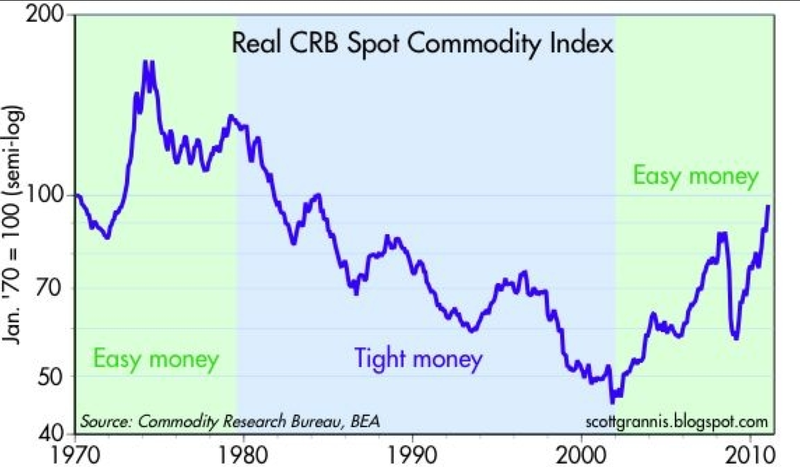 Such a consideration could, with good statistics based on good records, be reasonably dealt with by computing the "real", inflation-adjusted prices of commodities. 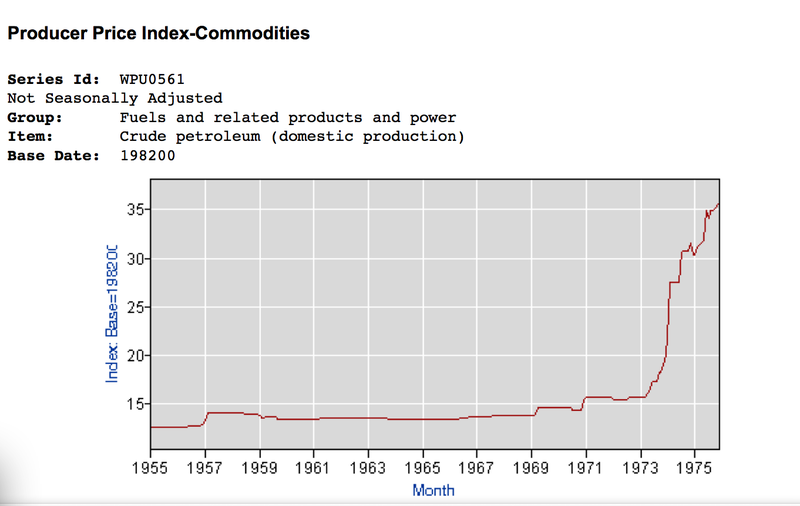 But commodity prices proceeded to skyrocket even in general-inflation-adjusted terms The dawn of the pure fiat, floating currency regime caused far deeper forces to come into play. For in reality, post-gold-standard prices for industrial commodities are not driven purely, or often even mostly, by industrial demand being met by appropriate changes in material supply. 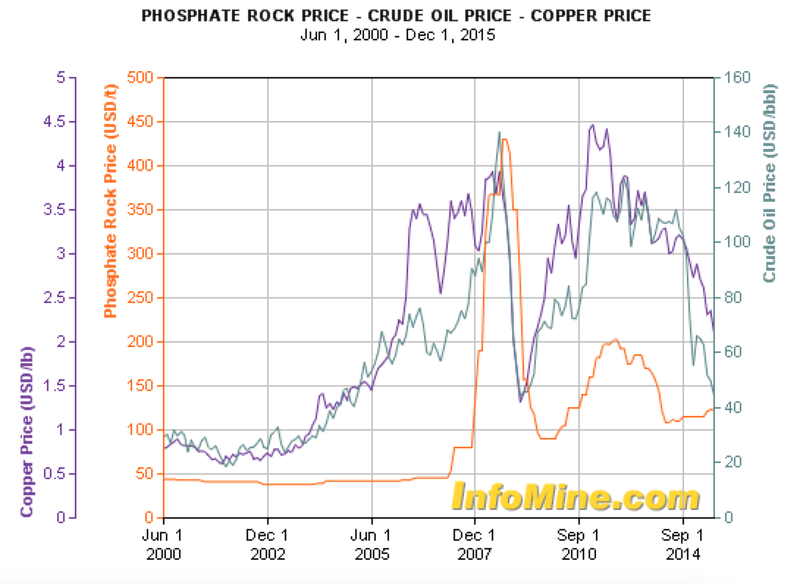 Instead, both supply and demand curves have been warped by a new role for the major industrial commodities -- they are no longer purely commodities; the are in part also money. In particular, they have since the late 1960s been increasingly used as a liquid store of value, easily tradeable for media of exchange (e.g. dollars), as an alternative to and hedge for the new regime of floating rate currencies. Bretton Woods (1947-70) and floating rate (1970-present) eras. What does it mean to say a commodity is part money? For this we need to turn to economist Carl Menger's theory of the origins of money. Menger's theory is less an accurate account of how money did historically originate among humans (which happened long before the dawn of the efficient commodity markets postulated by Menger), as a good theory and reasonably accurate set of predictions about how a free barter market economy does behave whenever it does arise. According to Menger, in a world of market-based barter, a very high cost (which economists would now call a transaction cost) comes from having to keep track of on the order of N^2 prices for the N goods, and the lack of coincidence of mutual wants between the holders of any two particular such commodities. For this reason market participants start spontaneously treating some goods as intermediate commodities. Intermediate commodities are held, not to consume them, but to store value until the next opportunity for exchange comes along. 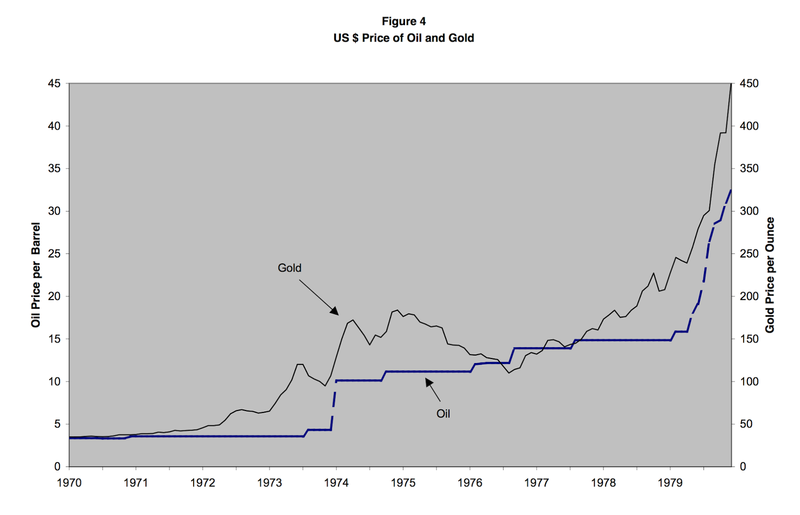 The intermediate commodity's price increases substantially from what it was when it was just demanded for its consumption: it obtains a price premium for its use as a store of value immune from the changing values of currency or currency-denominated assets the holder of the intermediate commodity would have otherwise held. This price premium waxes and wanes with the weighted changes in inflation expectations of the world's main traded currencies. Many commodities might be used this way: and every commodity that is used in this way becomes, in part, money. It is no longer just an good whose supply is driven by purely by the costs of production (since producers may choose to withhold production rather than sell for a currency whose inflation expectations have just increased, or may choose to increase production beyond the needs of immediate demand when inflation expectations have decreased), or whose demand is driven purely by desires or needs for its consumption (since some of the demand -- the vast majority of the demand in the case of gold and silver -- is now for its use as a store of value). It is an intermediate commodity, partial money. When the primary use of the commodity money is as a medium of exchange, for example the cigarettes used as money in some wartime prisons, strong network effects usually exist to cause the market to converge on one or a few standards -- historically, usually gold and silver. These undergo a "bubble that does not pop". But the other intermediate commodities, the commodities don't make it all the way to being dominant and nearly pure money, are bubbles that can and do pop. When the primary use of commodity money is, however, a store of value, a store of value that can be readily exchanged when needed for the actual medium of exchange, there is almost no network effect. Any commodity that can be stored and so traded can be used as store of value that will render the owner immune from the perceived or actual risks of holding a floating currency. This storage could occur in the form of a paper or digital future, or as the actual commodity in the warehouse, or even as a readily extractable mineral such as oil still in the ground. Since the end of Bretton Woods, the major industrial commodities, and especially the major geopolitical commodities such as oil and phosphates, have become Mengerian. They are no longer purely industrial commodities. They are also stores of value, places to put wealth in between obtaining money and spending it, that provide an alternative for those who wish to diversify away from, for various reasons, holding currency or assets such as bonds and derivatives that are defined by or correlated to the health of currencies. In the face of increasing inflation expectations, stockpiling of commodities also decreases the risk that further economic growth that nations may be expecting or planning for in their economies could only come at the costs of even purchasing the needed inputs at even higher prices in the future (e.g. China in the 2000s). Stockpiling of commodities is also a general strategy whenever international trust erode and leaders start thinking of potential risks that trade will be slowed or embargoed. There are other securities that can store and even grow value -- stocks, bonds, real estate. In many ways all these are better stores of value than commodities. However for a major financial and political power, they have drawbacks. First, they are trust-based -- you are trusting somebody (often a foreigner) to pay the coupons or dividends. In the case of real estate, it depends on the vagaries of local economic activity and politics. Commodities, especially commodities a government can physically control, are far more trust-minimized. The U.S. can sanction Russia by freezing the assets of its national held in paper or digital form in the U.S., but it cannot take the oil from Russia's wells or stop it from drilling, pumping, and selling it to e.g. Europe. Finally, commodities in most of their forms, especially as futures, are readily exchanged for pure money such as dollars. 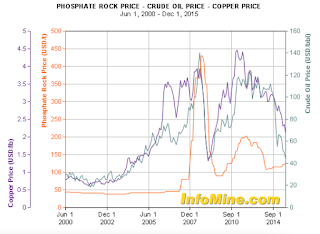 Since the theme of this paper is Malthusian resources, we shall focus on the waxing and waning of the intermediateness of commodities, and in particular the geolitical commodities oil and phosphate rock. We will see all these factors at play during the first and second Malthusian scares. 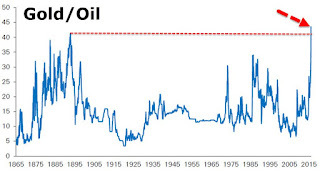 Oil "chasing the tail of gold"
As described above, the Bretton Woods era ended between 1968 and 1971, leading to the purely floating rate regime that has prevailed from 1971 to today. Free trade in gold, which had been banned under Franklin Roosevelt, was returned to the U.S. Shortly thereafter, in 1973-4, an event that many economists have deemed an "exogenous shock", and even a main cause of the dramatic oil price rises of the 1970s, occurred on the world stage: the Arab oil embargo of Britain and the U.S. in response to their intervention on behalf of Israel in the 1973 Yom Kippur War. 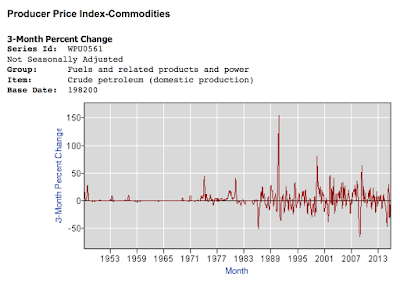 Around the same time OPEC more than doubled the dollar prices it charged for its oil. It is common but highly inaccurate to call OPEC a "monopoly cartel" at that time -- it accounted for only about 3% of U.S. oil consumption in 1967 and still only 6.7% at the end of 1973. It had increased its pricing power from negligible to slight; it could hardly have more than doubled the price of oil on its own had not other oil-producing companies and countries been of similar mind. by trading through cutout countries. By sharp contrast, the Suez Crisis of 1956-7, which produced a much more dramatic and longer-lasting impact on the world's oil supply chains -- Europe suddenly lost military control over more than half of the oil it consumed to a recently independent and hostile Egypt, never to gain it back -- was followed by a far smaller and more ephemeral percentage increase in oil prices. Due to the increased inflation expectations, oil producers conserved on pumping, despite rising prices and oil consumers stockpiled despite the rising prices of funding those purchases. The reverse would happen throughout the decreases in inflation expectations and resulting long decline in commodity prices during most of the 1980s and 1990s. Oil producers kept pumping beyond the needs of the industrial market to hasten the drawdown of their depreciating reservoirs. 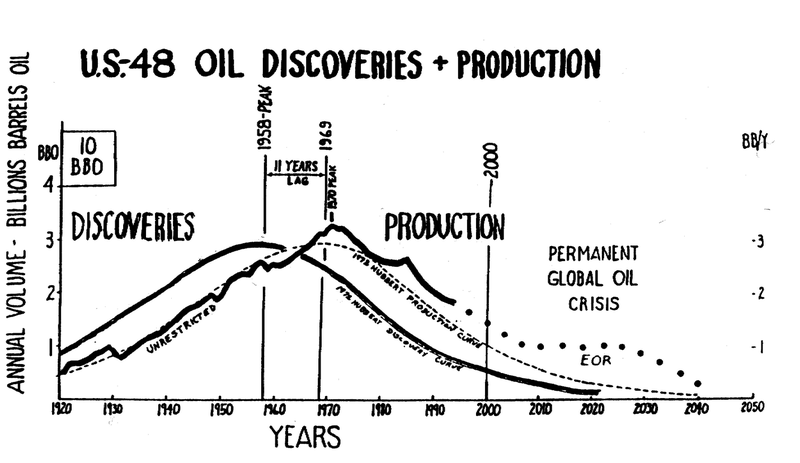 But during the first Malthusian scare, U.S. and European entities began stockpiling oil and other strategic commodities. For example U.S. oil imports from the Middle East, which had been only about 3% of consumption in 1967 when relations were friendly, had increased to 6.7% by 1973 even though relations had become hostile. and nominal prices of that oil had risen. Meanwhile U.S. oil producers were pumping less oil, choosing to keep relatively more of it in the ground rather than sell it for cheapening dollars. As in the 1970s, the commodity rise during the second Malthusian scare of roughly 2004-14 was often sharp and concurrently effected the vast majority of commodities. After substantial advances in both real estate and commodity prices the previous several years, during 2007 central banks cut rates and raise money supplies to fight collapsing real estate prices. These efforts fueled sharp increases in inflation expectations. 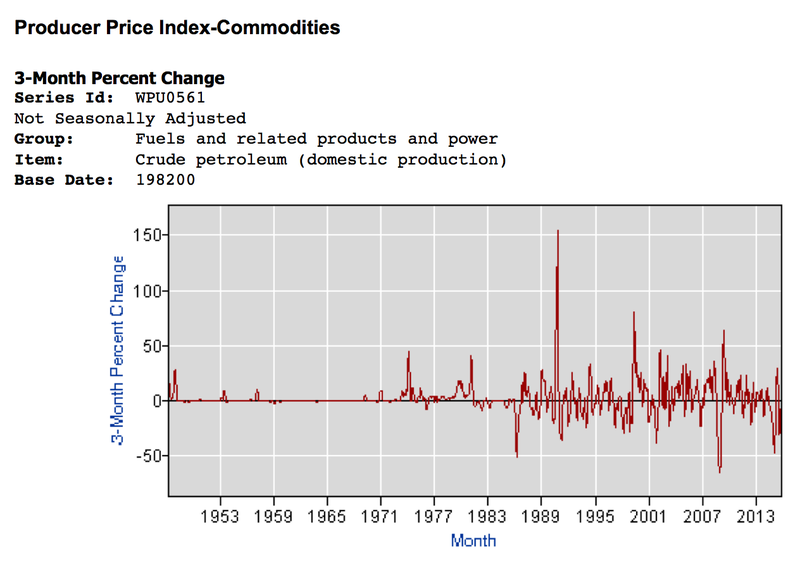 Nominal and CPI-adjusted prices of fossil fuels, precious metals, industrial metals, lumber, fibers, fertilizers, grains, oilseeds, dairy, and livestock all skyrocketed during 2007, hitting record highs in nominal prices. The market’s endless search for stores of value independent of the vagaries of fiat currencies had switched from real estate on which easy loans were defaulting to commodities that could be held more securely. This time the most (in)famous stockpiler was China, planning for the rapid economic growth it expected in the decades ahead. 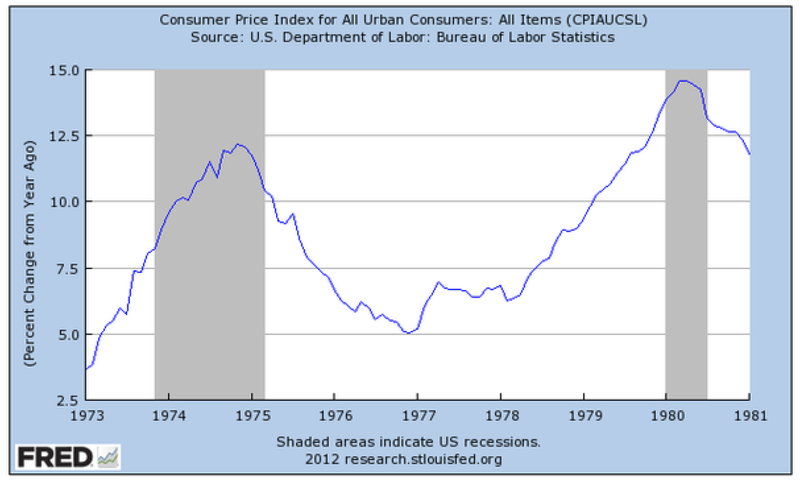 Also as in the 1970s, the individual components of this broad-range trend were attributed to a stupendous variety of idiosyncratic causes -- the co-occurrence of which all driving prices in the same direction at the same time was astronomically improbable. The only reasonable attribution would be to related common causes – which, given that there had been no sudden worldwide industrial boom, had to have been monetary causes. 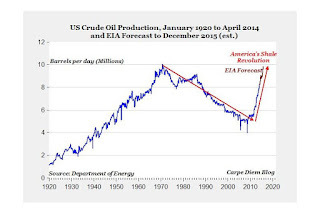 Warnings about peak oil, peak phosphorous, etc. issued from all the major media outlets and science journals. In Silicon Valley, a boom in "green technology" startups and investments ensued -- resulting later in mostly bankrupt companies. ...demand for the oft-dreaded but ill-understood "hoarding" and "speculation", that is storing extra commodities (often off-the-books, or at least not in the officially measured warehouses) and the purchase of extra commodity futures and other commodity derivatives to hedge transactions based on government currencies, will remain strong as long as the Federal Reserve continues to inflate the dollar supply, and as long as many developing countries continue to link their currencies to this dollar. 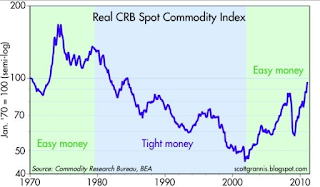 Commodity prices in dollars will level off, and then move back down close to historical trends based largely on just industrial consumption, if or when the Fed stops increasing the supply of dollars faster than the demand for dollars. apply at all scales not just to individual wells. 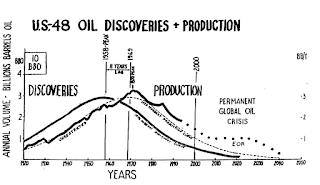 Oil thus demonstrated itself as a poorer monetary substitute than gold: being a much more novel commodity than gold, its production is subject to substantially more likelihood of technological invention and geological discovery. This possibility, which had not been sufficiently priced into oil before fracking, makes oil supply less reliably scarce than that of gold, rendering it less useful as a store of value, reducing the monetary premium of the oil price over oil as it would be priced if it were just an industrial commodity. 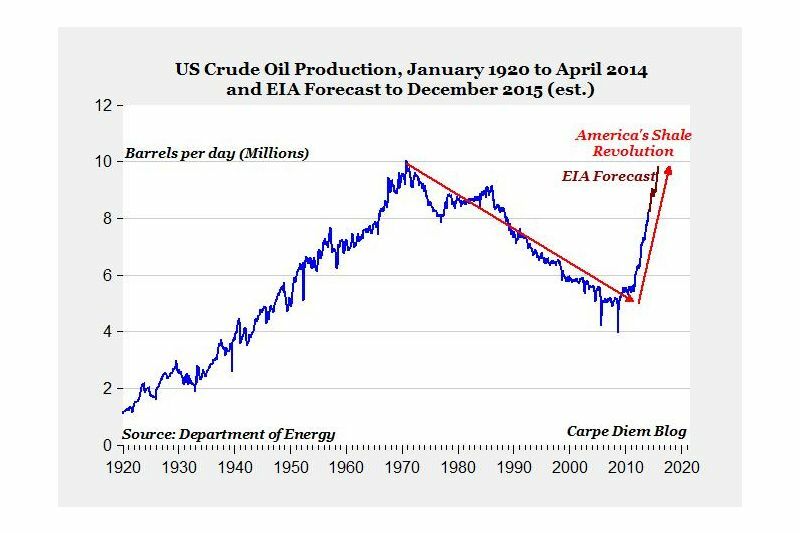 Secondly, of course, is the direct effect of fracking on the supply curve in lowering oil prices. The effects of the fracking revolution are amplified because more than just the Econ-101 supply curve shift is reducing oil prices due to fracking: oil's monetary premium is being eroded at the same time. 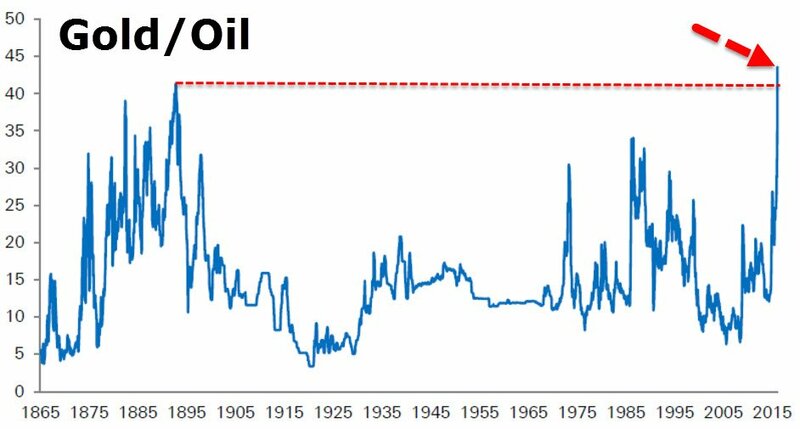 Oil had been a monetary bubble which is now bursting. If you are Saudi Arabia or Iraq sitting on large reservoirs of easily extracted oi, your alternative to treating oil as a store of value, if you still don't trust the Western powers, is to pump even more and trade the proceeds for gold (and also pay off some foolishly acquired debts) -- which is what we now see happening. Thus, paradoxically (to those who analyze oil as no more than an industrial commodity) oil producing countries pump more oil despite much lower oil prices. They are selling oil from their "oil warehouse" below the sands of the Middle East in exchange for gold, which due to the fracking revolution has reasserted its superiority as a trust-minimized currency over oil. If "money is the bubble that doesn't pop", partial money, i.e. Mengerian intermediate commodities, create bubbles that sometimes do pop, as the desirability of various commodities for their monetary properties, especially their value as a store of value relatively immune from political interdiction, waxes and wanes. During the Bretton Woods era the U.S. dollar, pegged to gold at $35 an ounce, served the entire free world as a common and reliable standard of value. The transition from Bretton Woods to floating rates left the world with no common and reliable standard of value by which to guarantee future real returns on contracts or investments. 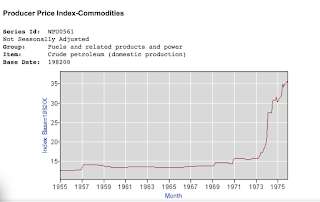 As a result the most commonly traded commodities, and especially geopolitical commodities such as oil and phosphates, became Mengerian intermediate commodities, with a price premium as a store of value that waxed and waned with the weighted expected inflation among the world's various floating currencies. 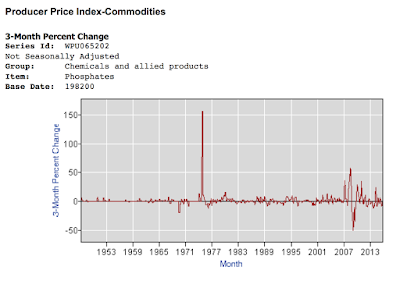 As a result, the prices of these commodities are much more volatile since 1970 than they were during the Bretton Woods era. Epochs of increasing inflation expectations have led to rapid, broad-based commodity price rises, where the market gives out false signals of scarcity, leading to Malthusian anxieties and panics that we face a future of diminishing natural resources. This in turn has fueled a major and sustainable growth in green ideology since the 1960s. 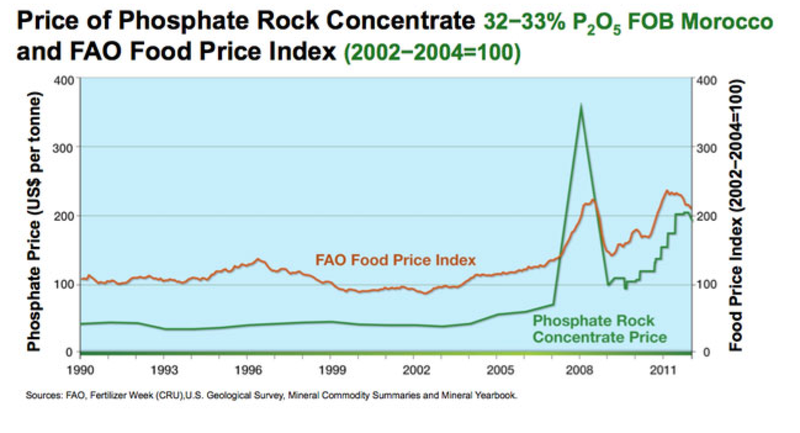 It's no longer debatable that commodity supplies in general pose few limits to long-term industrial growth, nor, except in the special case of phosphates, any significant limits that cannot eventually be innovated past by substituting newer more abundant materials for scarcer older ones. To obtain all the commodities we have consumed in history has involved barely scratching he surface of one planet. Scratching out somewhat more each upcoming decade and century into the foreseeable future is, in terms of that supply, by and large sustainable. A far more debatable proposition is to how much environmental impacts will or should limit industrial growth -- for example, what is or should be our ability to continue pumping more carbon dioxide into the atmosphere? That is a debate this paper shall leave for another day.